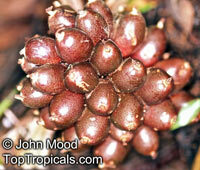 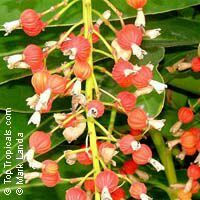 The genus Aframomum is well known in African forests because the bright red, fleshy fruit of several species contain a sweet juicy pulp and is eaten widely by primates and other mammals. 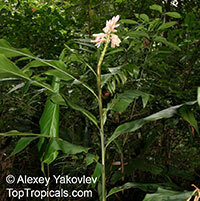 Aframomum melegueta is a herbaceous perennial plant native to swampy habitats along the West African coast. 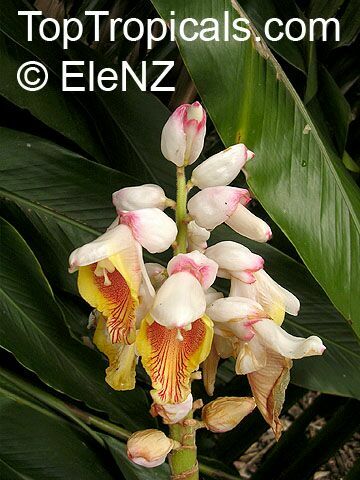 Its trumpet-shaped, purple flowers develop into 5- to 7-cm long pods containing numerous small, reddish-brown seeds. 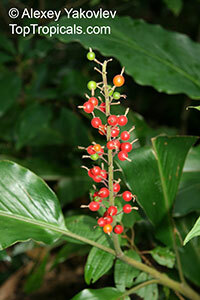 Galanga is an herb used in cooking, especially in Indonesian and Thai cuisines. 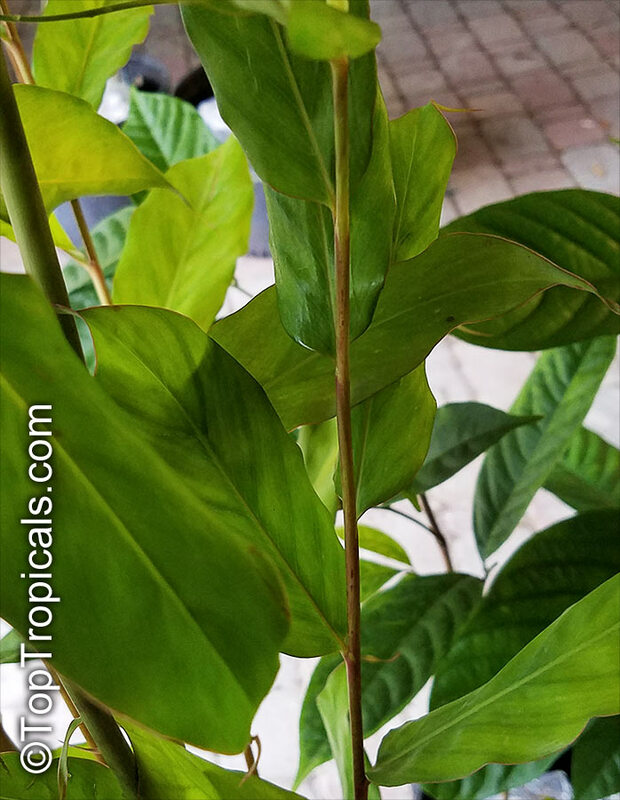 It is one of four plants known as galangal, and is differentiated from the others with the common name greater galangal (or simply Thai galangal). The galangals are also called blue ginger or Thai ginger. 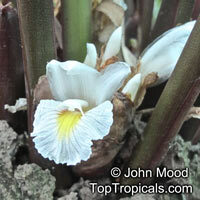 A. galanga is called laos in Indonesian and is the most common form of galangal used in cooking. 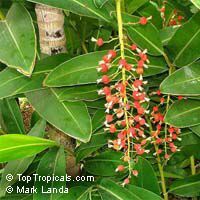 It is also known as lengkuas and galanga root. 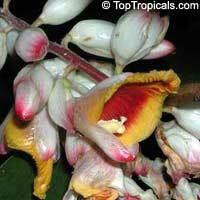 Alpinia officinarum, known as lesser galangal, is a plant in the ginger family, cultivated in Southeast Asia. It originated in China, where its name ultimately derives. It can grow several feet high, with long leaves and reddish-white flowers. 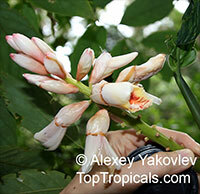 The rhizomes, known as galangal, are valued for their spicy flavor and aromatic scent. 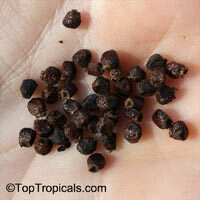 These are used throughout Asia in curries and perfumes, and were previously used widely in Europe. 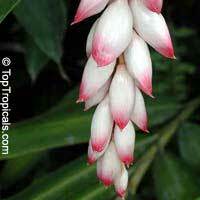 They are also used as an herbal remedy. Narrow-Leaf Cinnamon Ginger. 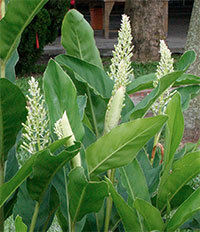 The plant is a low mounding ginger with glossy leaves, and amazingly fragrant foliage. Gently brushing the leaves is all it takes to release a spicy cardamom-like aroma. 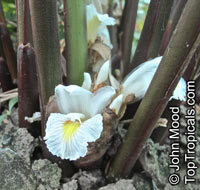 Rhizomes are ginger-scented with a touch of Cinnamon. 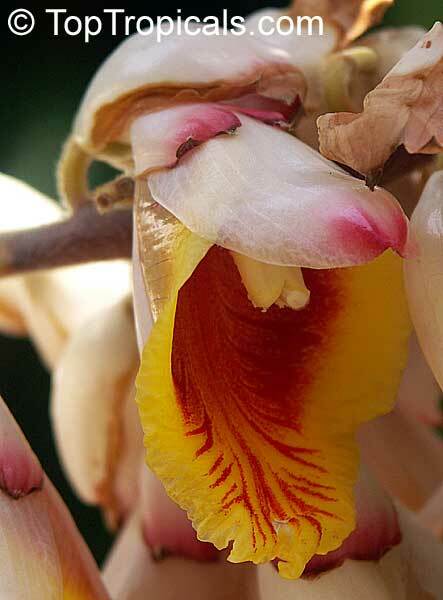 The flowers are quite beautiful, and resemble those of shell ginger to which it is closely related - the terminal inflorescence resembles that of Alpinia zerumbet, but with smaller bracts, and much larger, red and yelow labellums. 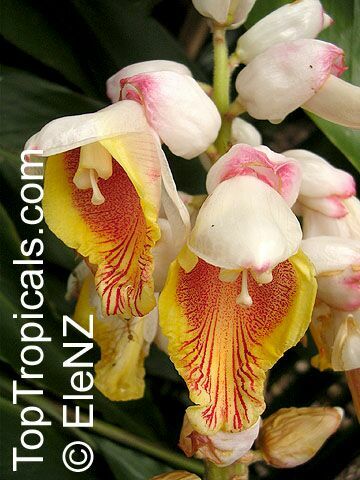 These are tubular flowers in droopy clusters and come mostly in summer. This plant has attractive glossy foliage. 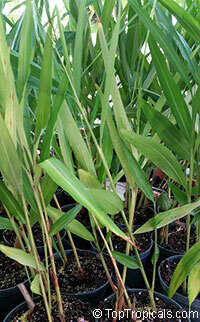 Lanceolate glabrous leaves emerge from dense stands of pseudostems. In a shady tropical garden, the glossy dense foliage is lush and beautiful. Hardy to zone 7, it is very easy to grow, and will grow from a small rhizome division into an enormous specimen in just a couple of years. If not protected from freezes, it will die back to the ground, but it will re-emerge from the rhizomes in the Spring, as long as the ground doesn't freeze. If you keep giving it room to spread, the clump will soon become several feet across and three feet tall. Keep soil evenly moist during the warm months, but allow to dry out a bit more during the winter. 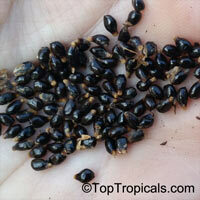 Do not fertilize during the Winter. 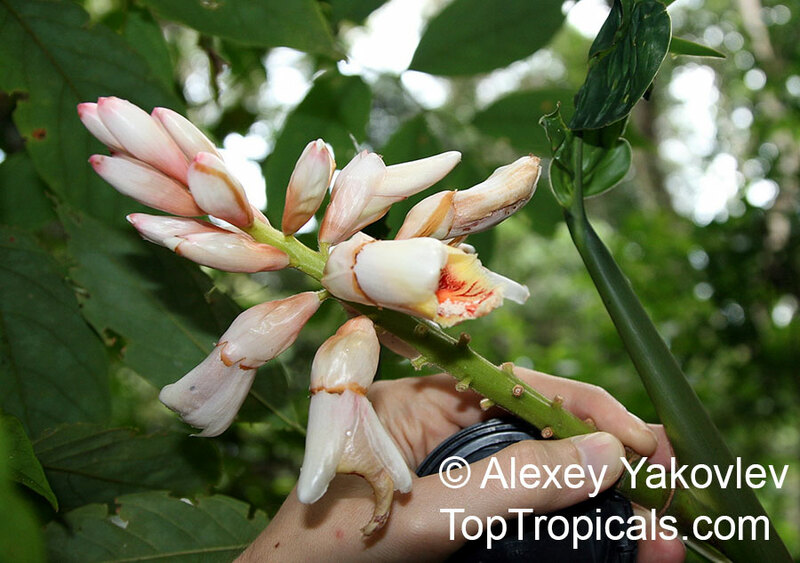 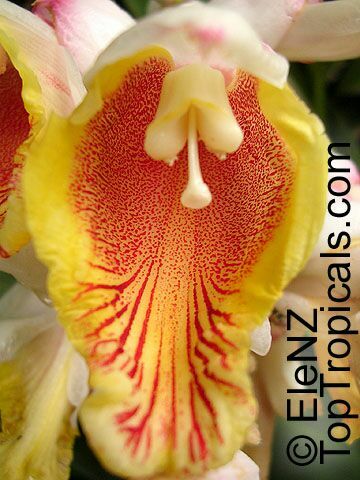 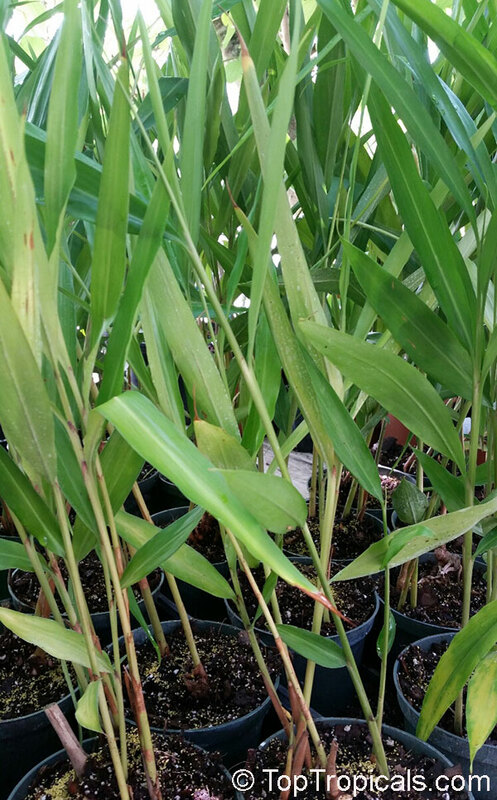 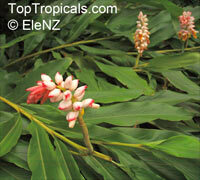 Alpinia nutans is very forgiving of soil type, and is reportedly tolerant of salt. 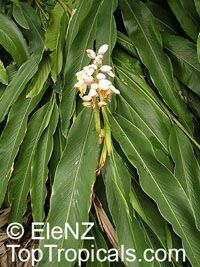 Hardy foliage plant is often used as a shade groundcover. 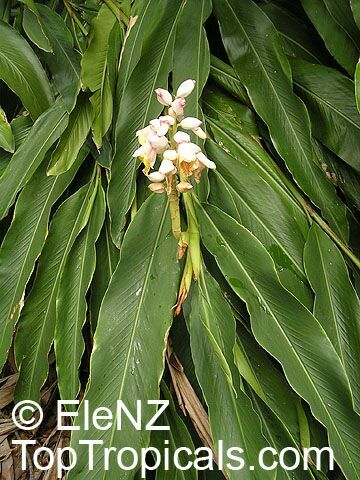 Alpinia nutans is a Southeast Asian medicinal plant used to control hypertension, as diuretic, antifungal, and antiulcer. 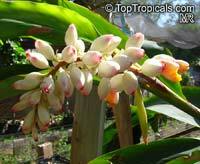 In Japan it is used as food preservative. 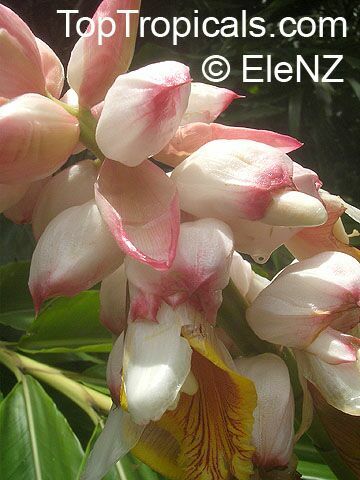 Alpinia zerumbet is called a "shell ginger" or "shell flower" most commonly, because its individual pink flowers, especially when in bud, resemble sea shells. 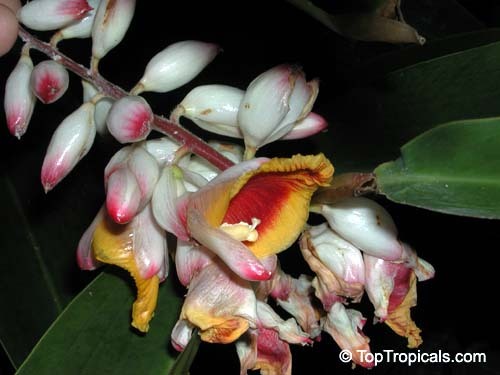 Alpinia zerumbet is similar to Alpinia malaccensis and Alpinia nutans. 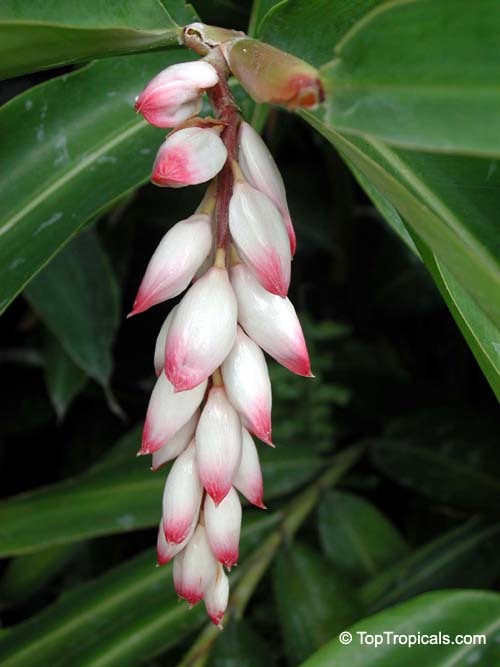 Alpinia zerumbet is called a "shell ginger" or "shell flower" most commonly, because its individual pink flowers, especially when in bud, resemble sea shells. 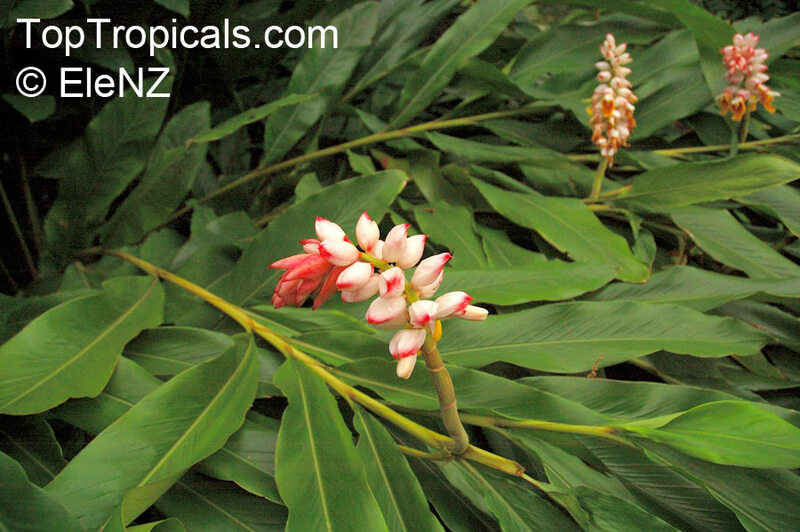 Alpinia zerumbet is close related to Alpinia malaccensis and Alpinia nutans. 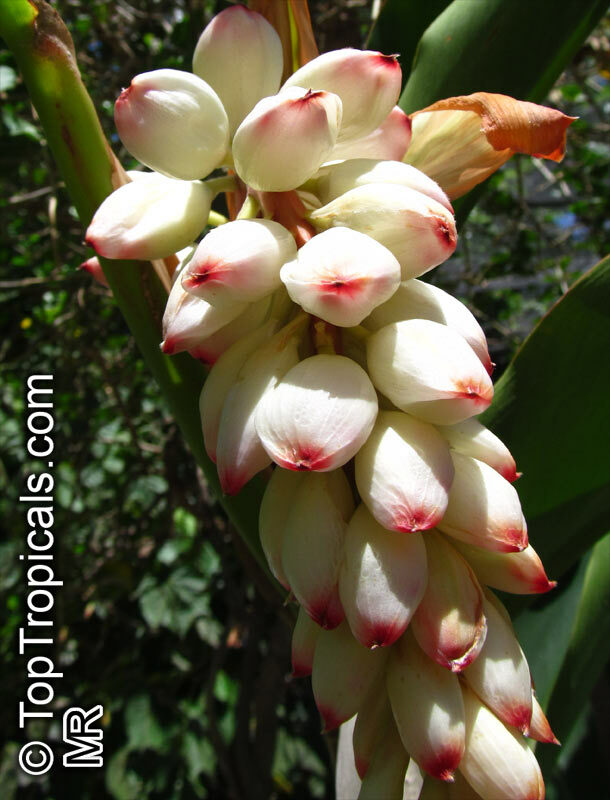 This relative of ginger is an aromatic medicine, which was often used as an antidote to poisoning.